What TV channels are free on antenna? It depends on where you live. Digital broadcast technology allows television stations to broadcast multiple subchannels at the same time. For example, a station’s main programming will be at channel 7.1, but they will likely have subchannels at 7.2, 7.3, 7.4, etc, which may broadcast movie programming, or children’s programming, or news. What major networks are free on antenna? ABC, CBS, NBC, and PBS. Some smaller independent networks also broadcast free over-the-air programming. What do I need to receive free television programming? You’ll certainly need an indoor or outdoor antenna. Also, if your TV doesn’t have a have a built in HDTV tuner, you’ll need to buy an external HDTV tuner to receive over the air broadcasts. You’ll pay once to buy the tuner and you will pay no rental fees. What’s the catch for free broadcast TV? Broadcast TV doesn’t provide the specialty networks available on cable, such as CNN, FOX and ESPN. Can I record broadcast TV to watch later? Basic HDTV receivers (which are built in to many TVs) allow you to watch only what is being broadcast "live", but advanced HDTV receivers, such as TIVO, allow you to choose and record programming to watch later, pause and rewind what you’re watching and skip commercials. If you decide to buy an advanced HDTV recorder/receiver, I recommend TIVO. I currently use TIVO Bolt and Roamio models, as do many of my family members and friends. Does my HDTV have an OTA Tuner? If your HDTV has a tuner then the manual will describe how to start the "autotuner" which will find and lock in all the channels that are being received by your antenna. To find the manual for your TV on the internet, type the brand and model of your HDTV followed by the words "PDF manual." Some newer televisions (such as the newer Vizios) are called "displays" and they do not have a built in HDTV tuner. They are intended to be connected to cable boxes or streaming devices. You will need to connect an external OTA tuner boxes to a non-tuner "display" to receive over-the-air television. Your smartphone has a built in compass and is ideal for pointing your antenna because you can use it while adusting your antenna, wherever it is. 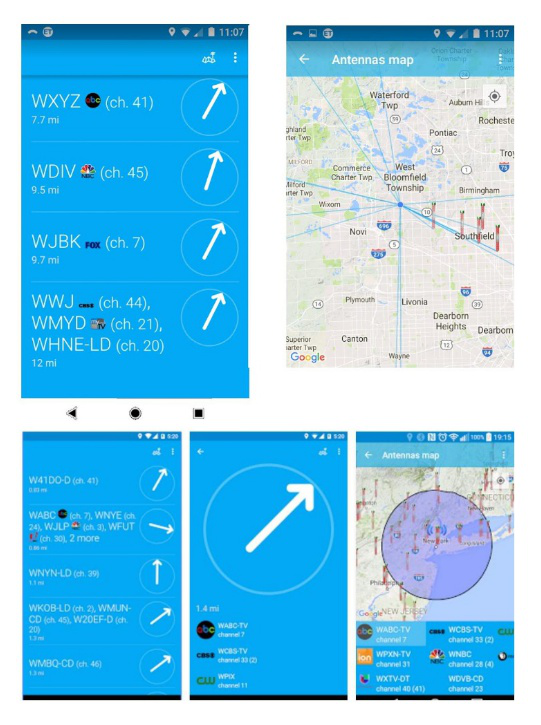 An antenna pointing app on your phone will display the best direction to point your antenna to receive the greatest number of stations in your area. 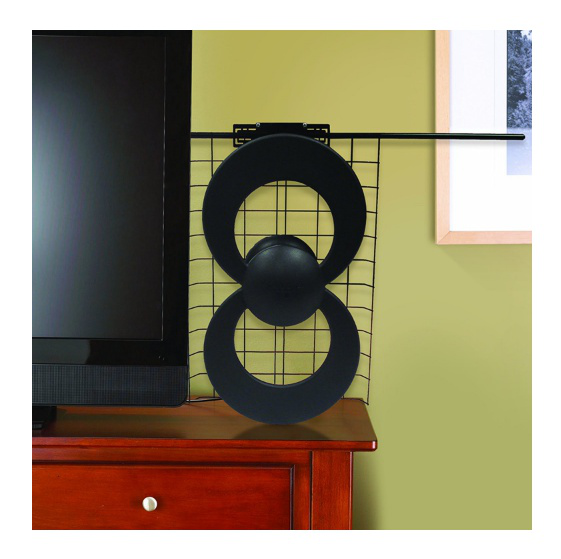 Easy & FREE HDTV Antenna! Is the old-style antenna on your roof still wired into your house? Connect it to your HDTV and you may be surprised that it works perfectly well! Old style antennas capture signals in a single direction which is why some of them were installed with motorized rotators. Use the antenna pointing app to set the antenna’s direction and you may be surprised by how many HD channels you’ll receive. An old-style antenna is not a great choice if you’re buing a NEW HDTV antenna. Instead, see my recommendations below. 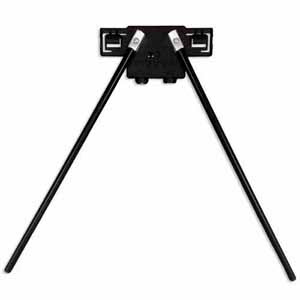 A friend of mine was receiving perfect reception using one of these cheap flat HDTV antennas. 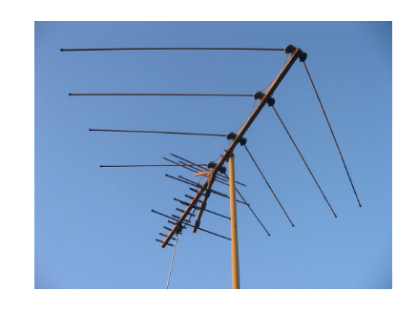 These flat antennas are similar to the "rabbit ear" antennas that many of us grew up with. I tried a few different models in a few different homes and sometimes they worked perfectly, but sometimes it did not. Flat indoor HDTV antennas are not all the same. I tried a few different sizes and models and recommend the Mediasonic HomeWorx HDTV Antenna which had noticably better reception wherever I tried it. In general, the larger flat antennas worked better than the small ones. All the flat HDTV antennas I tried will work best if they’re placed near an outside wall or window. They won’t work as well when used in a basement or a place where the signal must penetrate multiple walls. 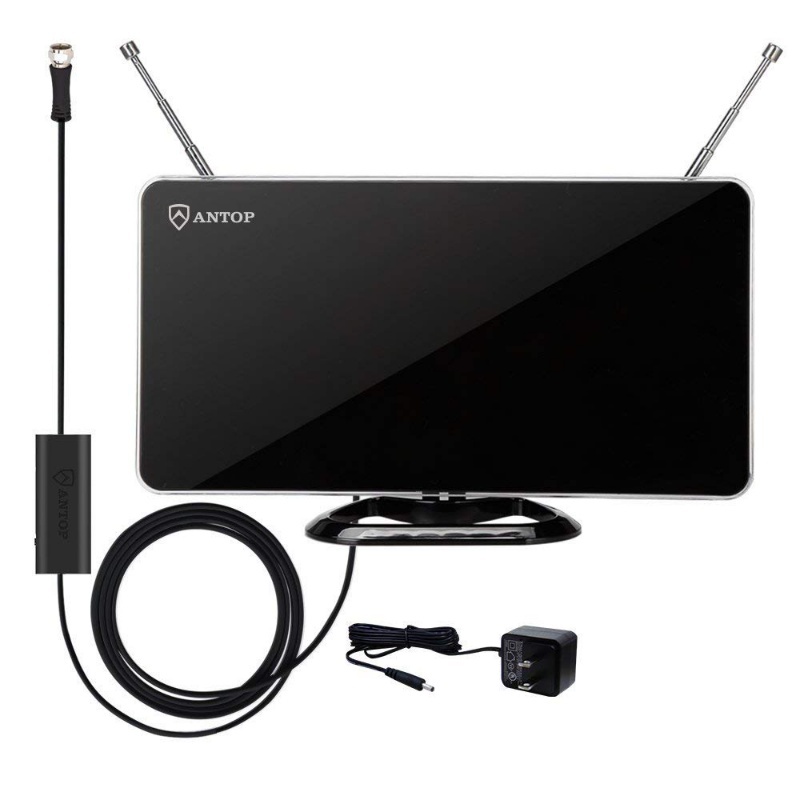 Some flat HDTV antennas include suction cups that allow you to affix the antenna to a window. You can also use tape to attach it to the back of your TV, or use small tacks or pins to attach it to a wall. The good news is, both of these indoor antennas are cheap and easy to try. Keep the one that works best for your location and return the other to Amazon for a refund. The 60-mile version of the ClearStream HDTV antenna is the one shown below, it’s the model I use, but note that is is available in several models that promise reception ranges from 35-miles to 70-miles. 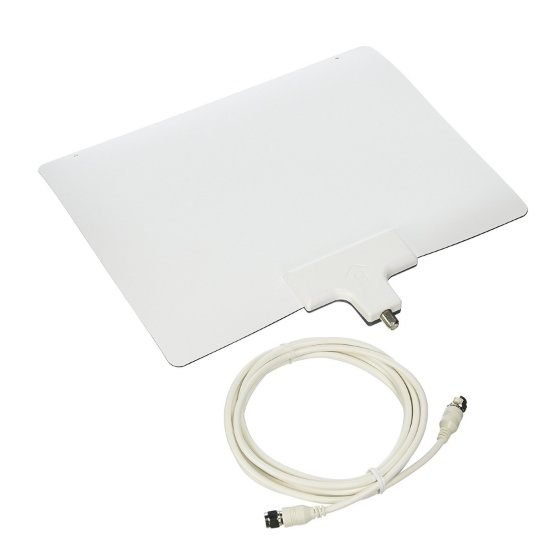 The ClearStream HDTV Antenna is plastic over metal and can be used indoors, outdoors, or in an attic. I like this antenna it because it’s somewhat small and the dark colors make it almost invisible on my roof. The compact design of the ClearStream HDTV antenna makes it less likely to be damaged by wind or inclement weather. Outdoor mounting hardware is included with this antenna. You’ll need to mount it to a wall or build a stand if you want to use it indoors. I tried a couple of these 4-bay and 8-bay antennas (shown below) and they didn’t work as well as I had hoped. Specifically, I had trouble receiving some stations on rainy and snowy days. Note that the design of 4-bay and 8-bay antennas can be prone to damage from wind and bad weather. In my area, reception from one station in my market (Channel 7, Detroit) was actually too strong when I used any bay-type antenna, causing the signal to break up. I resolved the "too strong signal" problem by adding the VHF add-on kit described in the next section. 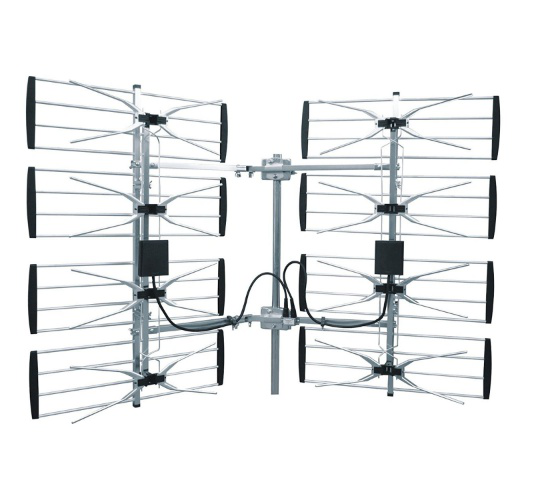 The Antennas Direct VHF-1 VHF (chan 2-13) Add-On Kit provides reception for channels 2-13. When my bay style antennas were having a problem with Channel 7 in my area, adding this VHF antenna fixed the problem. Note that a VHF "add-on" antenna is already built-in to the more compact ClearStream HDTV antenna that I recommend and currently use. Please write with any comments or questions!